The AKOYA, an amphibious aircraft that is known for its elegant design, streamlined forms, and graceful curves, is unveiling a new side to its personality with a new external design. The AKOYA, which can be fully personalized, is now available in “ice blue,” as an example of the extensive customization possibilities for customers. The preceding AKOYAs were painted in a gleaming and very elegant pearl white, enhanced by its green eye as an extension of the canopy, echoing the lining of the cockpit. LISA has chosen a more audacious color—which underlines the brand’s identity—for the aircraft’s new look. Extensive research and tests were conducted to find the right balance and identify the color that perfectly reflects the essence of LISA and the company’s values and identity, while enhancing the AKOYA’s contours. This pure and gentle color is inspired by nature—the blue of the glaciers, the sky, and the sea that embodies all the light aircraft’s versatility. The color will also inspire you to travel to exotic places. The graphic design extending the canopy has also been redesigned. 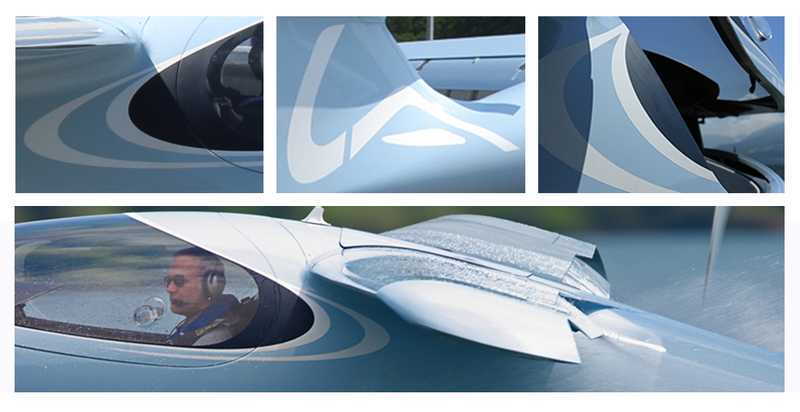 It highlights the large panoramic canopy and enhances the aircraft’s streamlined and aerodynamic lines. The combination of a slightly iridescent ice blue, enhanced by several swathes of deep-sea blue and white lines highlights the AKOYA’s natural curves and identity. The new contemporary color, which is gentle on the eye and original, combined with an understated design, is the look that has been chosen to perfectly reflect the AKOYA’s elegance and the innovative spirit of its creators. During the past few months, LISA’s engineers have worked on a major update of the AKOYA aircraft.